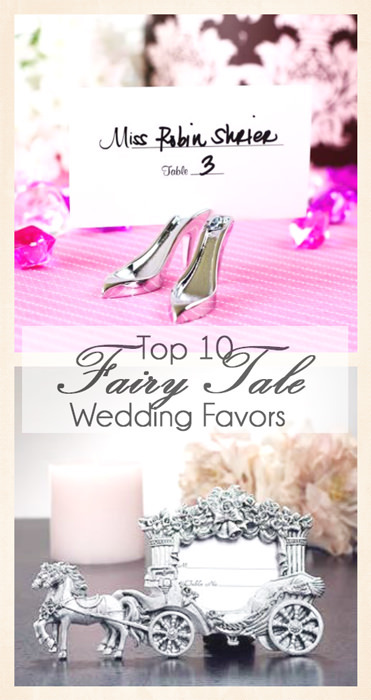 Fairy tale wedding themes are perfect for your big day if you are ready for your prince to slide the glass slipper on your foot and whisk you away in a beautiful carriage. 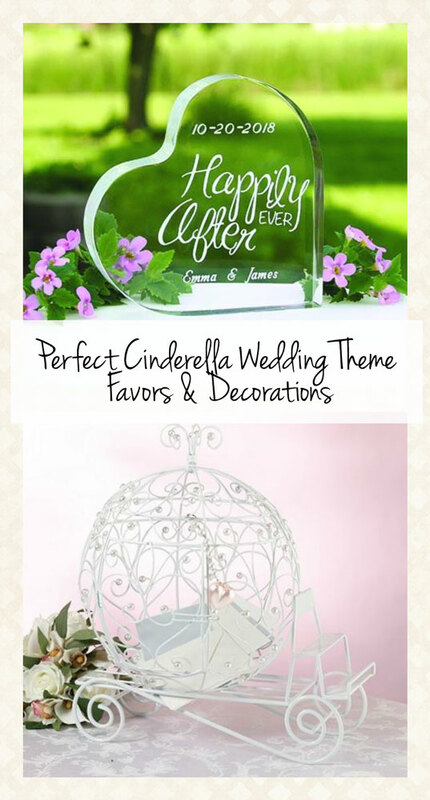 You can embrace the spirit of OR tune into your inner Cinderella (which ever sounds better) to create the perfect vibe for your ceremony and your celebratory reception. It’s easy to pick up cheap wedding favors and decorations in this theme from local stores, but what are the chances that your guests will actually take those home at the end of the wedding? You don’t want to waste money on favors that no one really enjoys, especially when there are so many affordable favors on the market that are functional keepsakes. This list will introduce you to 10 of those options. 2. 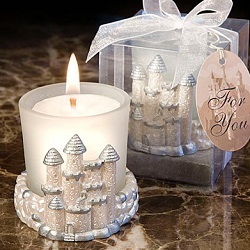 Once Upon a Time Candle Stands - Each of these stands will hold two taper or stick candles and one larger, round candle. 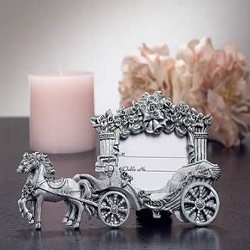 They represent a beautiful carriage and two horses to carry it into the future of blissful happiness. These are easy to incorporate into your table arrangements, and many guests will enjoy taking them home if you want to offer them as favors. 6. 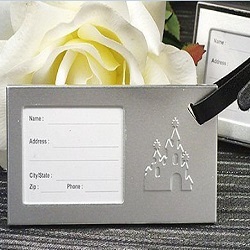 Fairy Tale Luggage Tag Favors - If your guests travel, this a wedding favor that they will hang onto rather than tossing in a forgotten drawer. 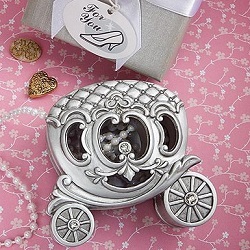 Each tag is silver and features a castle, so they fit perfectly with the fairy tale wedding theme. 7. 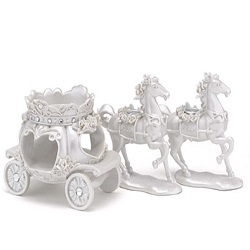 High Heel Place Card Holder - Set a high-heeled slipper at each place setting so that every guest feels like a princess on your big day. 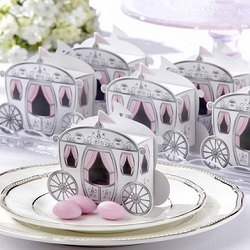 These holders are adorable, and will grab tons of attention as your guests look for their reception seats. 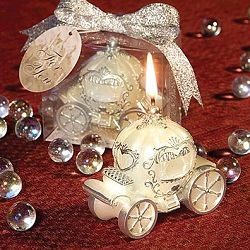 They are affordable and will contribute to the décor while giving each guests a fun favor to take home. 8. Coach Candles - If you can’t afford candles sitting in their own little holders, you may have room in the budget for these adorable stand-alone coach candles. 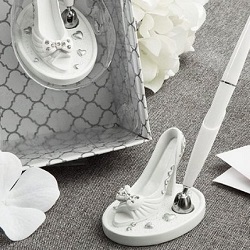 They still come in their own boxes with silver bows, and they will give your guests something charming to remind them of your big day. 9. 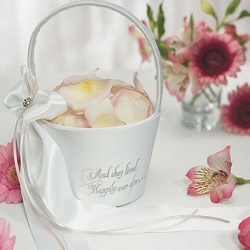 Fairy Tale Dreams Flower Girl Basket - This beautiful white basket features a white bow on the side and reads “And they lived happily ever after” along the side. Fill it with rose petals and send the flower girl down the aisle like a princess in training. 10. Fairy Tale Themed Pen Set - This isn’t necessarily a wedding favor that your guests can take home, but it is an essential element of your wedding preparation. As your guests file into the ceremony, they will want to sign their name in your guest book. This pen sits in a beautiful slipper and allows them to recognize your theme before they even walk into the ceremony and take a seat.